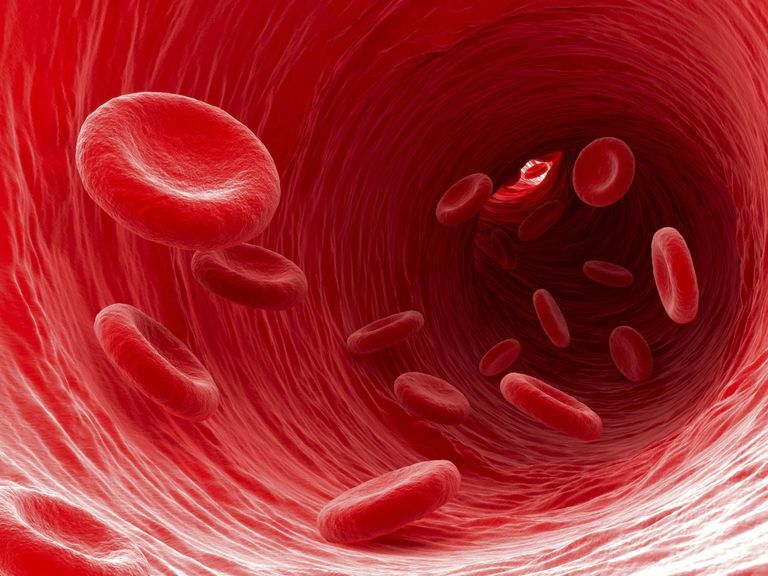 Polycythemia vera is a disorder in which the bone marrow makes too many red blood cells, white blood cells, and platelets, which can lead to an increased risk of blood clots. Having too many red blood cells is the most prominent clinical sign of polycythemia vera. A mutation in a gene for JAK2, a protein involved in signaling within the cell, has been found in many people with this condition. Polycythemia vera can occur at any age but often happens later in life. If you look at the ages of all the people with this condition, the middle number for age at diagnosis would be 60 years, and it is not often seen in people under age 40. The incidence of polycythemia vera is slightly higher in men than women and is highest for men aged 70 to 79 years. It is difficult to tell for sure, since a person may have this condition for a long time and not know it, but estimates are about one or two people out of 100,000. According to Incyte Corporation, a Wilmington, Delaware, based biopharmaceutical company specializing in oncology, there are approximately 25,000 people in the United States who live with polycythemia vera and are considered uncontrolled because they develop resistance to or intolerance to a mainstay of drug therapy, hydroxyurea. Incyte is partnering with approximately 200 community and academic medical centers to conduct the study in the U.S. called REVEAL, which recently began enrolling patients, and is expected to include 2,000 patients under the supervision of a physician for the active management of this disease for a period of three years. Is It a Cancer or a Disease? Polycythemia vera has some characteristics similar to cancer as it involves uncontrolled division of an immature cell and it is not curable. Knowing this, learning that you or a loved one has this disorder can understandably be stressful. However, know that this condition can be managed effectively for very long periods. According to The Leukemia & Lymphoma Society, people with polycythemia vera are at slightly greater risk than the general population for developing leukemia as a result of the disease and/or certain established drug treatments. Although this is a chronic condition that is not curable, remember that it can usually be managed effectively for a long, long time—and it does not generally shorten life expectancy. Additionally, complications can be treated and prevented with medical supervision. Yes, but details about the risk of progression are still being researched. Although people may not have symptoms for many years, polycythemia vera can lead to the development of a number of symptoms and signs, including fatigue, itchiness, night sweats, pain in the bones, fever and weight loss. About 30 percent to 40 percent of people with polycythemia vera have an enlarged spleen. In some individuals, it can lead to debilitating symptoms and cardiovascular complications. The burden of this disease is still being actively researched. A test called the hematocrit concentration is used both to diagnose polycythemia vera and to measure a person’s response to therapy. Hematocrit is the proportion of red blood cells in a volume of blood, and it’s usually given as a percent or an increase in hemoglobin concentration in the blood. In healthy people, hematocrit concentration ranges from about 36 to 46 percent in women and 42 to 52 percent in men. Other information that can be gleaned from blood tests is also helpful in the diagnosis, including the presence of a mutation—the JAK2 mutation—in blood cells. Although it’s not required to make the diagnosis, some people may also have a bone marrow analysis as part of their workup and evaluation. According to The Leukemia & Lymphoma Society, phlebotomy, or the removal of blood from a vein, is the usual starting point of treatment for most patients. This can reduce the hematocrit concentration, which usually results in the improvement of certain symptoms such as headaches, ringing in the ears, and dizziness. Drug therapy may involve agents that can reduce red cell or platelet concentrations—compounds referred to as myelosuppressive agents. The most commonly used myelosuppressive agent for polycythemia vera is hydroxyurea, given by mouth. More common side effects include cough or hoarseness, fever or chills, lower back or side pain, and painful or difficult urination. Ruxolitinib (Jakafi) is a prescription medicine used to treat people with polycythemia vera who have already taken hydroxyurea and it did not work well enough or they could not tolerate it. Jakafi is also used to treat certain types of myelofibrosis—a scarring of the bone marrow. According to the FDA, Jakafi works by inhibiting enzymes called Janus Associated Kinase (JAK) 1 and 2 that are involved in regulating blood and immunological functioning. The drug’s approval to treat polycythemia vera will help decrease the occurrence of an enlarged spleen—splenomegaly—and the need for phlebotomy, a procedure to remove excess blood from the body. The most common side effects associated with the use of Jakafi in participants with polycythemia vera in qualifying clinical trials were low red blood cell counts (anemia) and low blood platelet counts (thrombocytopenia). The most common non-blood-related side effects were dizziness, constipation, and shingles.